Distracted driving is a cause of road accidents that future, driverless vehicles promise to eliminate. Until then, certain startups teach AI to recognize common human mistakes. Unlike human brains that engage in multiple tasks–often failing to stay focused–self-driving cars don’t have the capacity for distraction. Their design, given our built-in suspicions against autonomation, will hinge on high safety standards. Fully autonomous cars haven’t hit the road in large yet. Semi-autonomous cars are out there now, however, and they are rigged with technologies supposed to assist the early 21st-century driver. Talking on the cell phone, using devices and gadgets, texting and e-mailing–all of these are a part of daily life. Yet, doing these activities behind the wheel is dangerous for everyone. It’s estimated that distraction is responsible for 68% of accidents on the road with 1.6 million crashes every year. According to stats from the U.S. National Highway Traffic Safety Administration, distracted driving is responsible for over 3,000 deaths and multiple hundreds of thousands of injuries each year in the United States. At any given hour of the day, it is estimated that 660,000 drivers are using their cell phones while driving. Nauto, Inc. is a startup that develops AI-based autonomous tech solutions and driver-assist systems, mainly hardware and tools related to safety. 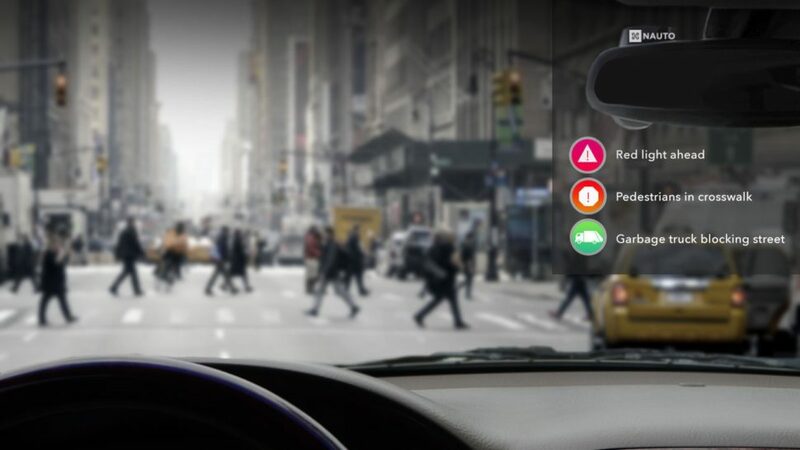 Recently, the company launched Nauto II, which is an AI-powered device that not only tracks the external driving environment but also monitors the driver’s behavior and detects moments of distraction. Nauto II, which was designed so that it fits in any vehicle, is the industry’s first anti-distraction kit intended for commercial customers. Using a multi-sensor, dual camera system (facing inward and outward), the device gathers visual data from inside and outside the vehicle and an AI provides corrective feedback to the driver. The system captures images of the driver (head, eyes, and chest) and, thanks to a deep learning algorithm, compares them to non-distracted control images. If the system detects that the drivers set their eyes off the road, it will alert them immediately and also record the event. Such information could then be used to corroborate insurance claims. For example, Nauto’s data would be able to prove that the driver was focused at a specific time. The obvious issue, of course, is that customers have to consent to this kind of data collection. With that in mind, how much data that the AI collects is actually relevant to determining typical driving behaviors? If drivers know they are being observed, how accurate are these observable standards? However, there’s still the possibility that a driver’s eyes are stuck on the road while their mind is far away. The developers of Nauto II aim to be able to detect cognitive distraction, which is a lot more tricky and difficult to detect than the obvious, behavioral distraction.